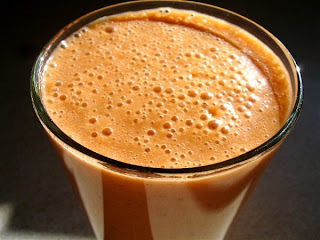 Juice the carrots and add the carrot juice, nut milk (I used almond), bananas, pumpkin and spices to the blender and puree until smooth and creamy. 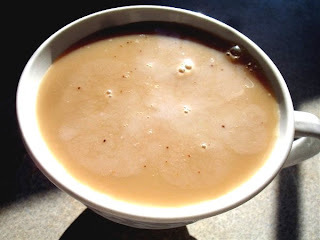 I used everything at room temperature and blended long enough to warm it just barely. And save the carrot pulp, it makes a great addition to salads ... I call it "carrot fluff." I think I may have a new favorite recipe and this is it. It's so creamy and flavorful. Set aside a couple mushrooms, one chopped scallion, and the tsp olive oil for garnish. 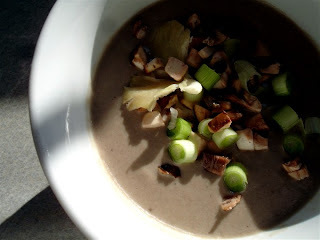 In a blender, add the mushrooms, pressed garlic, chopped scallion, nut milk, and 2 tbsp olive oil. Puree until very smooth. This can take a minute or two, especially in a regular blender. Pour in serving bowl and salt and pepper to taste. 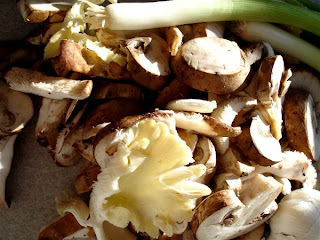 Garnish with chopped mushrooms and scallions and drizzle with 1 tsp olive oil. This could be heated in a dehydrator before garnishing for a warmer soup. Grapefruits are a bit expensive this time of year, but this is worth it. Peel and section a grapefruit. Slice off the top and bottom, then the sides. 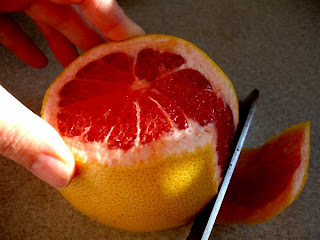 Use a knife to separate the grapefruit flesh from the membrane. 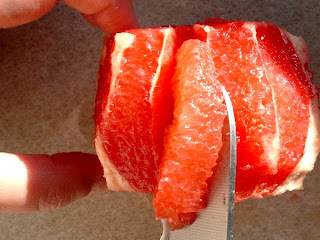 Set aside grapefruit sections. Squeeze the juice from what is left of the grapefruit. This should yield about 3-4 tbsp. To the grapefruit juice, add the agave and olive oil. This will be the dressing. 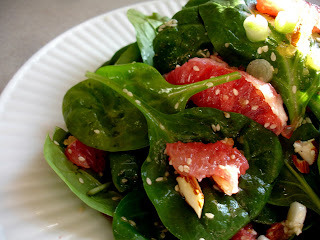 Toss spinach leaves with the grapefruit sections, scallions, and slivered almonds. Sprinkle with sesame seeds and add the dressing. I've been experimenting with different ice "creams" and sorbets almost all summer and into fall. 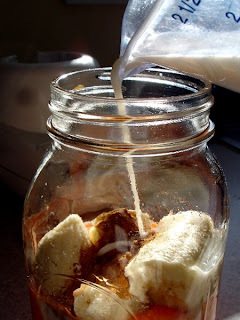 Nearly every concoction has a base of frozen bananas, which are smooth and creamy when blended. 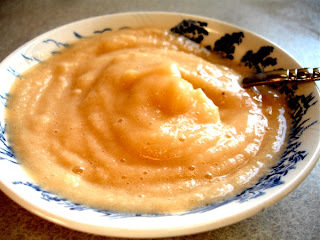 In this recipe, I used cantaloupe from our garden that I'd frozen back in the summer. Let the frozen cantaloupe and banana sit out for 5-10 minutes, to let it thaw ever so slightly. This will keep it from freezing together into a solid lump in the blender. 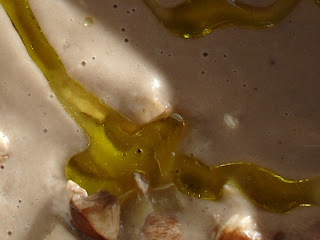 Then, puree together with the almond milk and vanilla. I prefer the soft serve texture, but this can be further chilled in the freezer to make a stiffer consistency. I love your blog - all the food looks really good. The cheapest I ever get bananas is around 25 - 30 cents each, and more than that if I buy organic ones. So I want to know: where do you buy bananas for 10 cents each?! I wish I could shop where you do! The bananas surprised me too, but more so the spinach leaves. Around here, 5 oz runs $2.69 and up. Ugh. 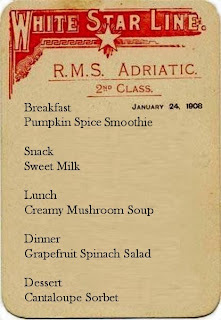 The Pumpkin Spice Smoothie looks wonderful, BTW. So does the Sweet Milk, as well as several other things. 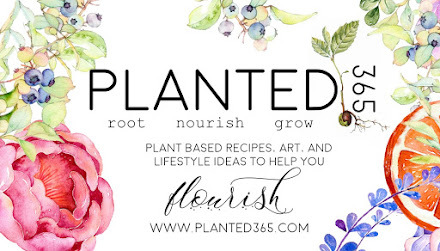 Glad to find your site!